We spent six days based in Ragusa, exploring the city and the surrounding area. Here are a few street signs and announcements that caught our attention. In this episode, you’ll learn what the heck “capuliata” and “MUOS” are, and why people love the first and hate the second. 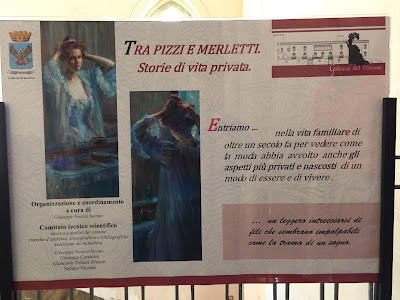 Left and center left: Explanation of the fundraising for the church organ in Chiaramonte Gulfi. Center right: Sewer cover "fognatura". Right: American unexploded WWII bomb in Chiaramonte Gulfi. 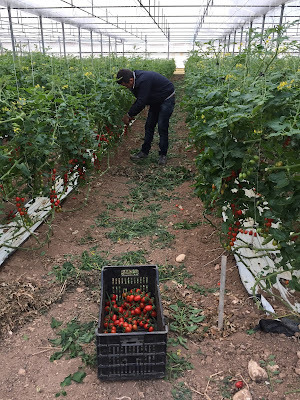 We had a lunch reservation for the winery Locanda Gulfi and went a few hours early to walk around the nearby town of Chiaramonte Gulfi. 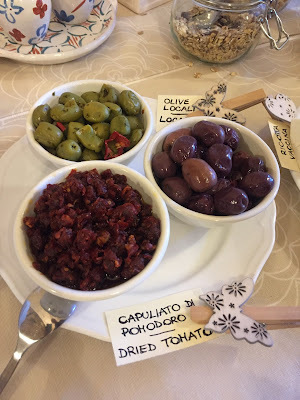 Locando Gulfi Winery: great views, okay tour, okay food. It didn’t wow us in particular, but visiting a winery is not the norm for us. 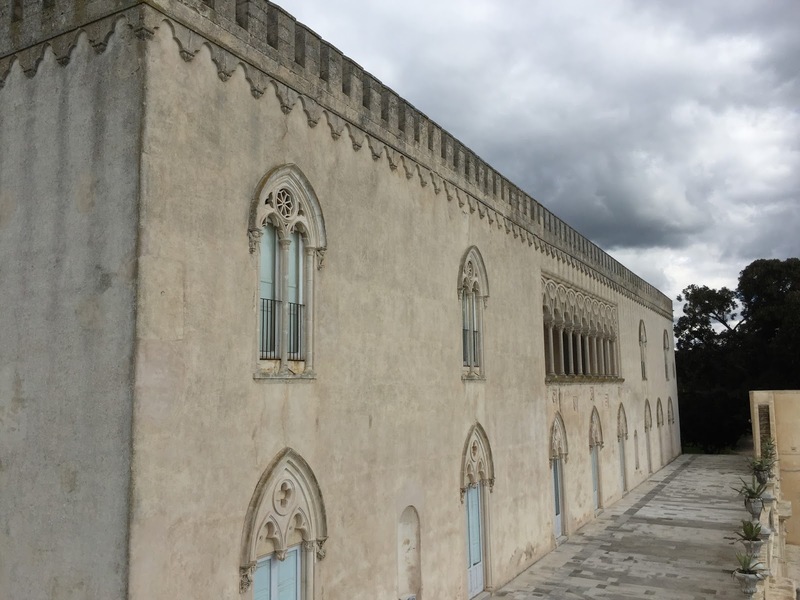 On the other hand, the town of Chiaramonte Gulfi was unexpectedly charming, especially the Giardino Pubblico Comune and adjacent Balcone di Scilia with its panoramic views. The plants in the park were well-maintained, and a number of them had associated labels with the scientific and common plant names. That’s my kind of park. 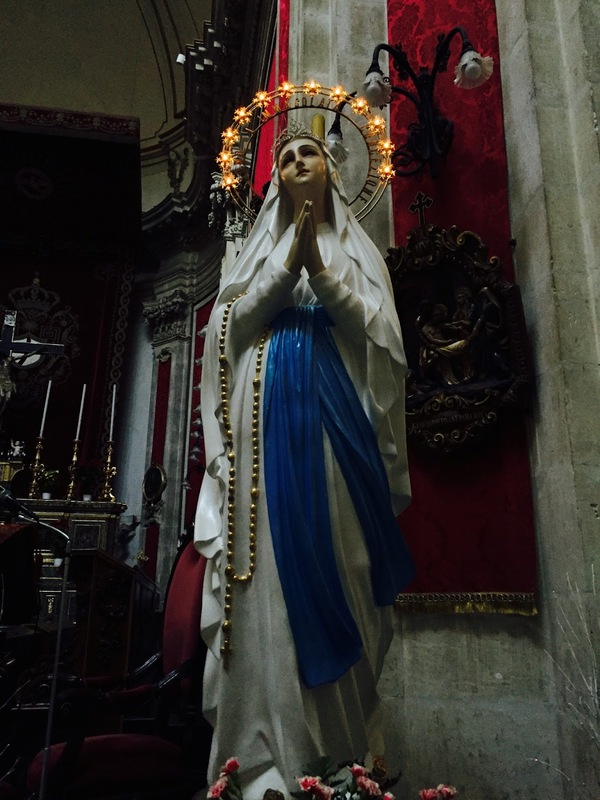 We saw the sign in the photo in the main church, Chiesa Madre S. Maria La Nova. The church is restoring the organ (organo) asking for donations by enticing people to adopt an organ pipe (canna d’organo). Remember, the pronunciation of organo has the stress on the first syllable as òrgano, not orgàno. My American English-trained ear has the tendency to put the stress toward the end of the word, which has people scratching their heads as to what I’m trying to say. Besides òrgano, other words with similar stress are: òrfano, fégato, cómpito, sìmbolo, and sìllaba to name just a few. In these words (sdrucciole) you put the stress on the antepenultimate, or third-to-last syllable of word. 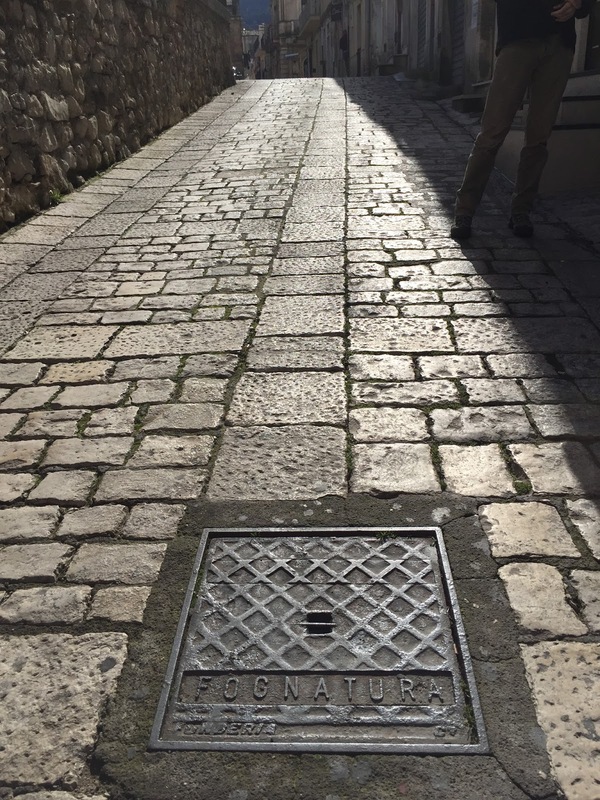 This word was on a sewer cover in Chiaramonte Gulfi. 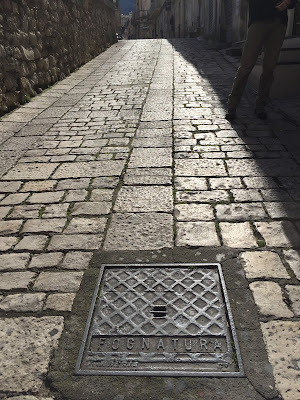 Related words are the verb fognare – equipped with sewers, and the noun fogna – a sewer. According to this list of Italian suffixes, tura indicates the action expressed by the verb, in this case fognare. 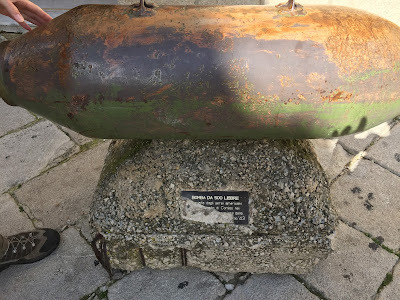 This unexploded, American WWII bomb was displayed in Piazza Duomo, Chiaramonte Gulfi. The information plaque on the bomb was partially destroyed, but it looks like it landed somewhere near Comiso. 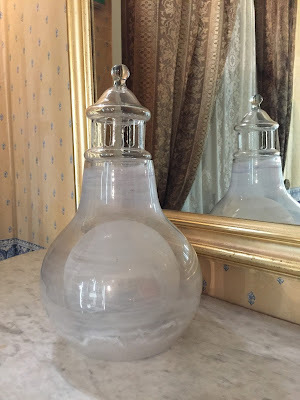 Left and center left: Glass vessel for killing flies at Castello di Donnafugata with explanation. Center right and Right: A display on the corset at Castello di Donnafugata. 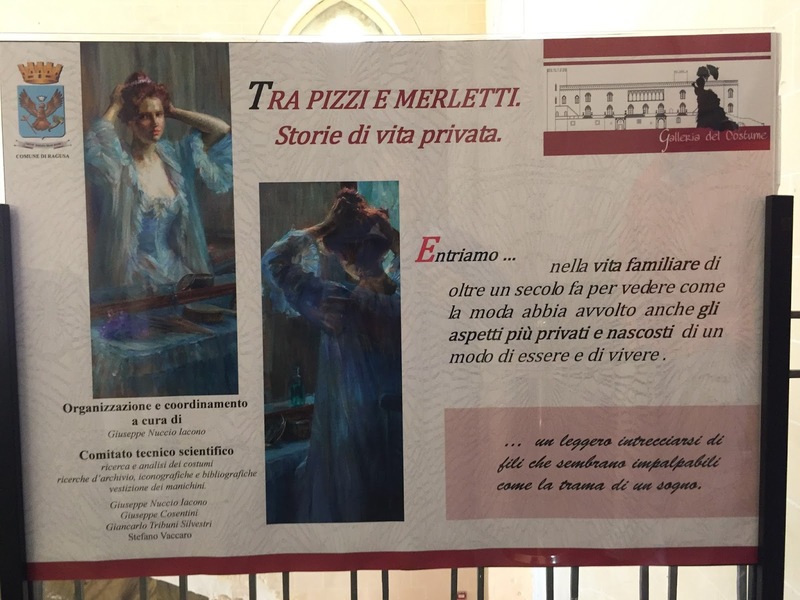 Left: Information on the exhibition Tra pizzi e merletti. 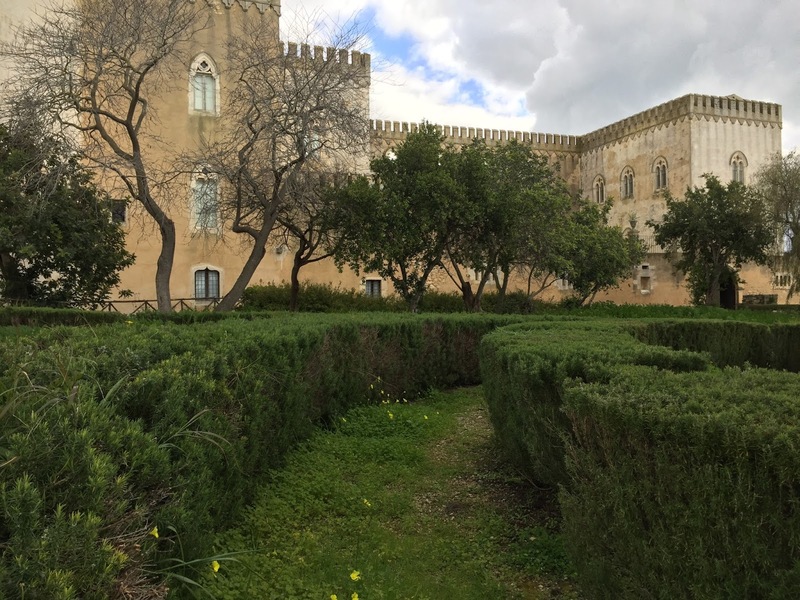 Center and right: Views of Castello di Donnafugata. I admit that I was a little obsessed with going to the Castello di Donnafugata. As soon as I knew there was a labyrinth there, it was something we definitely had to do. The day we arrived there, I was patient enough to go through the castle (more a mansion than a castle) first instead of running straight to the labyrinth. Inside the 28 of the 122 rooms of the mansions open to the public, we saw rooms decorated in a mix of styles as well as a parts of the exhibition Tra pizzi e merletti – Storie di vita privata, dedicated to corsets, bodices, fabrics, and other intimate wear from times of yore. 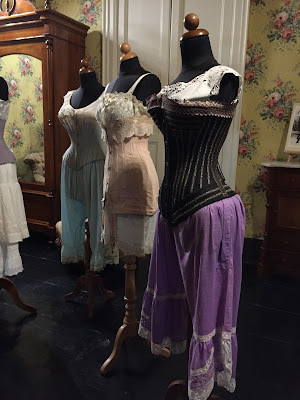 One room contained this display about the corset, il busto. There is a play on word with fiato sospeso, literally “breath suspended”, but better translated as “bated breath”. Wearing a corset caused problems like not being able to breath. Also in the Castello Donnafugata, we saw two large glass vessels used to kill flies. Perhaps the translation of ampolla to ampoule doesn’t help because it's a pretty obscure English word. A moscha is a fly. Moschicida is composed of moscha and cida. 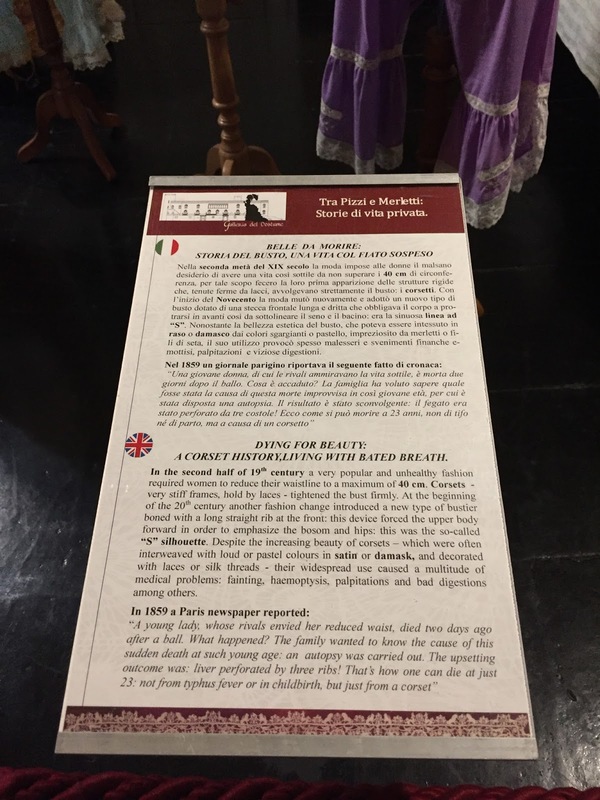 The Italian suffix cida is used in the sense of tagliare (to cut or slice) or uccidere (to kill), just like those corsets displayed in an adjacent room. Left: Obscene acts signage. 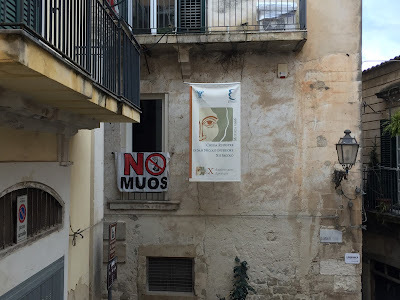 Center: No MUOS sign in Modica. Right: Information sign at Pantalica on how long different types of material take to decompose. We were a bit lost. 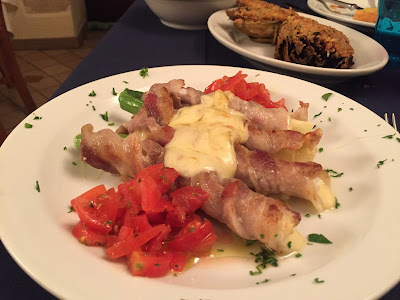 We had finished lunch in Rosolini at the very good Antica Osteria U Suliccenti and saw some pictures on the wall there for prehistoric temples nearby. We thought: how hard could it be to find those. Answer: Hard. We never found what we were looking for. In a narrow lane somewhere in the farmland north of Rosolini, we ask a guy where Grotta Lazzaro is. He asks some guys in a truck who just pulled up and they start talking about where the place is. Meanwhile, traffic starts backing up and we feel embarrassed. After a few moments, the first guy tells us to follow the guys in the truck. We follow them for a bit and end up at Cava d’Ispica (northern part). It’s not what we were looking for, and it’s closed for the afternoon anyway. We ask the girl in the café nearby, and she and a local talk and consult a book. They give us directions to something nearby, up the road. In the end, we end up in the parking lot near Cannizzara, Cava d’Ispica. 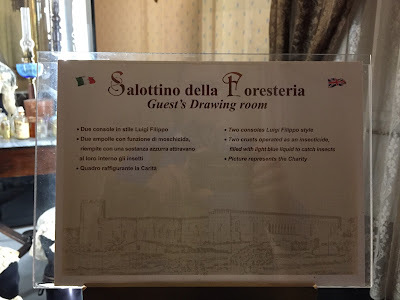 It’s the parking area for a number of grottoes, including Grotta dei Santi (“The Saints Grotto") and Tomba a finti pilastri ("Tomb of the Fake Pilasters"). Not what we were looking for, but we'll take it. In the parking lot near a number of well-known tombs, we found this sign. 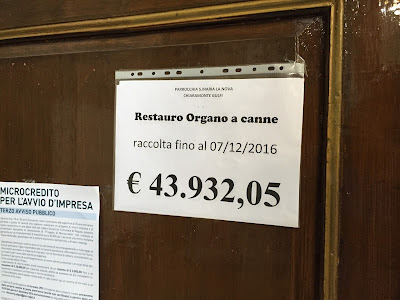 The sign continues: Chiunque, in luogo pubblico o aperto o esposto al pubblico, compie atti osceni è soggetto alla sanzione amministrativa pecuniaria da euro 5.000 a 30.000. After the trudge through mud to find the tombs, we decided to clean the mud off our shoes in the parking lot. Does that count as an obscene act? We saw this sign in Modica and then a sign with the same statement outside of Ragusa. That got me wondering and off to the internet I went. MUOS is a global satellite communications system primarily used by the US Department of Defense, scheduled to replace a legacy system. One of the ground stations for the system is in Niscemi, Sicily, about 40 km away as the crow flies from Ragusa and Modica. 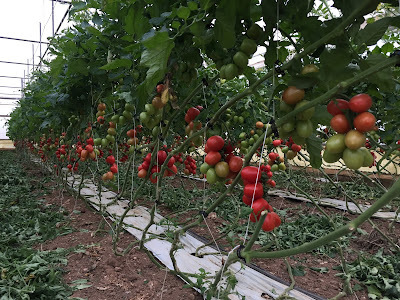 The No MUOS campaign came up out of concern for the health risks and environmental damage reported to be caused by the radio waves from the system. This sign was seen at the Necropolis of Pantalica where we spent a day exploring some of the thousands of rock-cut tombs. 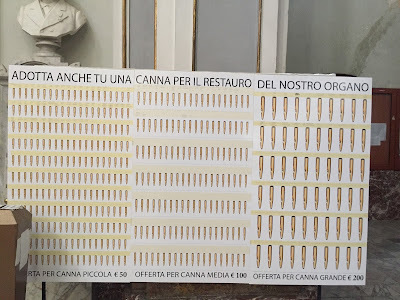 The items mentioned in the sign are sigarette (“cigarettes”), resti di frutta e verdure (“remains of fruits and vegetables”), giornali (“papers”), filtro di sigarette (“cigarette filters”), fazzoletti di carta (“paper tissues”), piatti, posate, bicchieri di plastic (“plastic plates, silverware and cups”), polistirolo (“styrofoam”), accendino in plastic (“plastic cigarette light”) sacchetto in bioplastica (“biodegradable plastic bags”), lattina di alluminio (“aluminum cans”), fiammifero (“match sticks”), sacchetto di plastic (“plastic bags”), bottiglie di plastic (“plastic bottles”), chewing gum, card di plastic (“credit cards”), bottiglia di vetro (“glass bottles”). 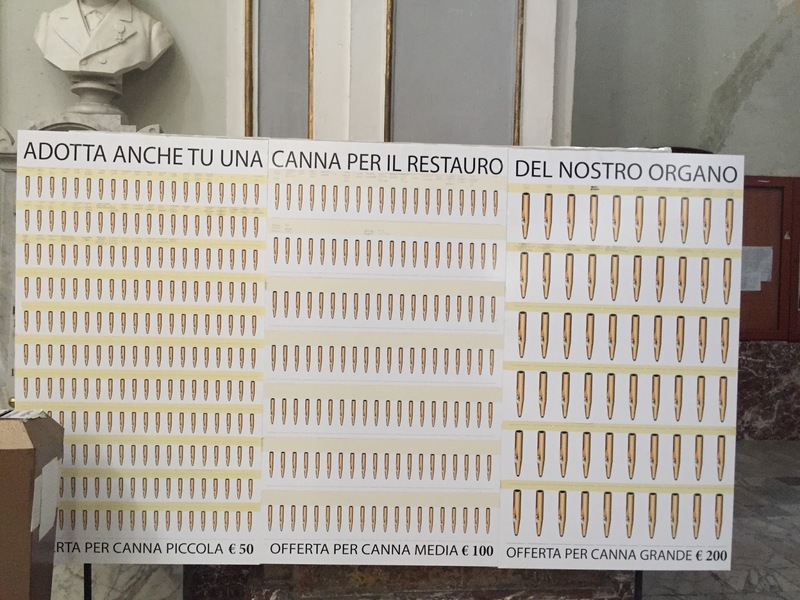 A typical example from the sign reads: 100 - 1000 Anni. 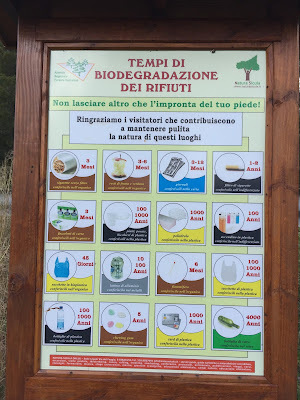 Bottiglie di plastica: conferiscile nella plastic. This translates as “100 – 1,000 years (to breakdown). Plastic bottle: put them in plastic waste”. Conferire here is to assign. Just think if the population who last lived at Pantalica in the early medieval period had discarded plastic bottles, we might still see them today. Left: Capuliato at Hotel Sabbinirica. 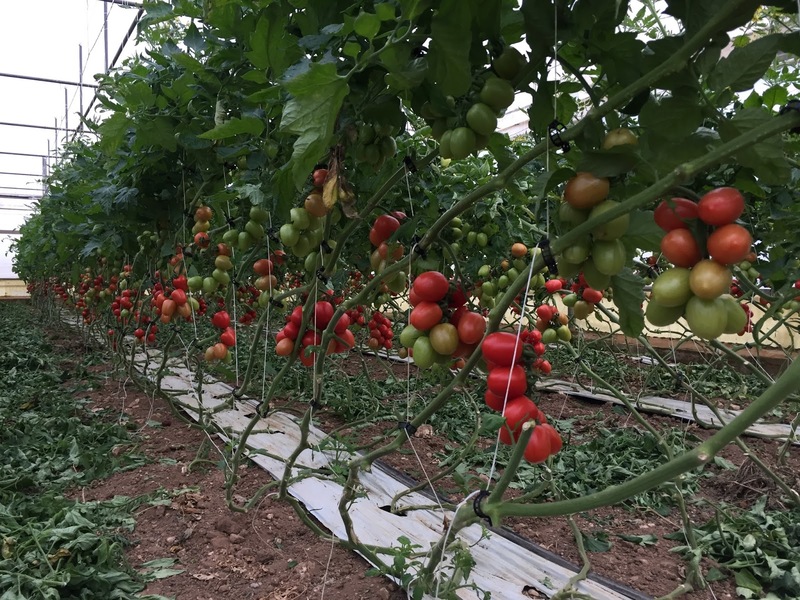 Center and right: Tomatoes at Giovanni Parisi. This capuliata greeted us every morning we went down for breakfast at Hotel Sabbinirica. For once, something in English that has a longer description than its Italian counterpart. Capuliata is a condiment common in Sicilian cooking. We stayed 7 nights at Hotel Sabbinirica in Ragusa Ibla. The name of the hotel itself, “Sabbinirica” is interesting in that it derives from a respectful way to greet an older person or someone of authority, roughly equivalent to “god bless you” or che Dio ti benedica. 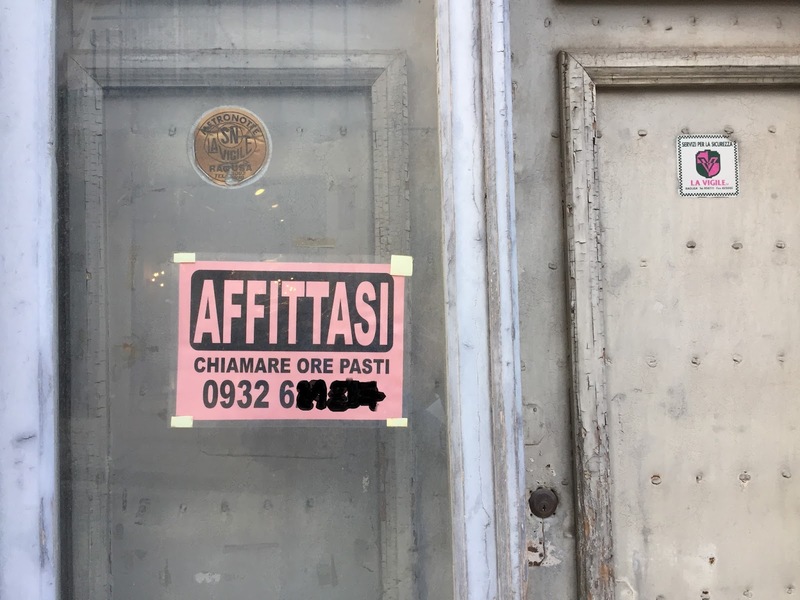 Left: Sign on the kitchen door of Quattro Gatti: Scinni i duocu. Right: Appetizer at Quattro Gattti, spring onions wrapped in pancetta with cheese. As explained to us, scinni i duocu means “get down from there”, in dialect. In Italian proper, you might say scendi da lì. The sticker was on the door to the kitchen in Quattro Gatti restaurant in Ragusa. We ate there twice during our stay. Very good. When we asked what the sticker meant, the owner explained it and also explained that the sticker is to promote a local climbing club with that name. 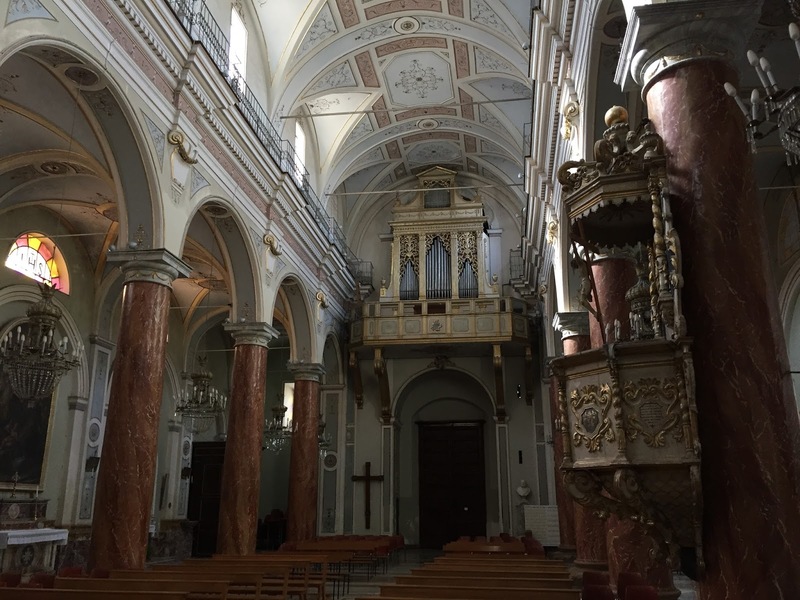 Left: Duomo di San Giorgio, Ragusa Ibla. 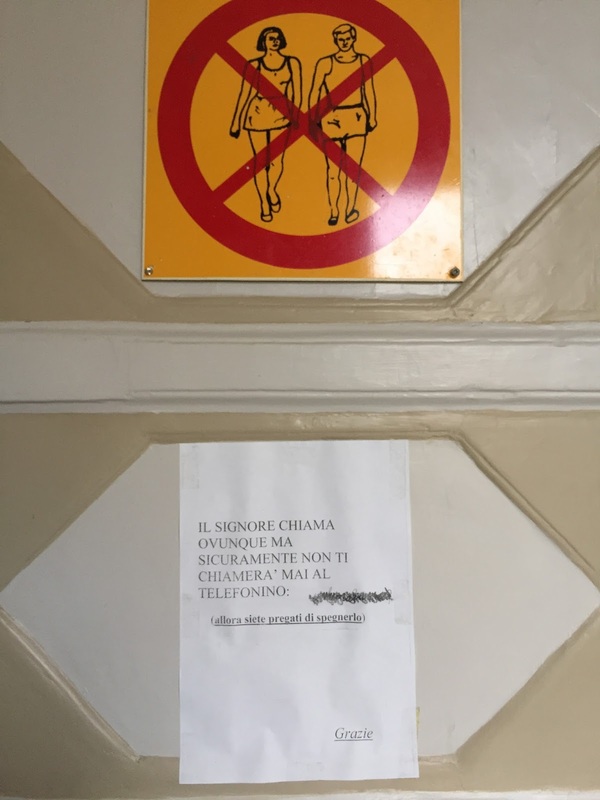 Center: Sign at entrance to the church informing people to turn off their phones. Right: Praying that people turn off their phone. 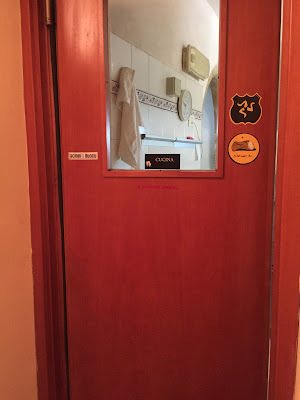 Left: Affittasi sign - but only call during mealtimes. Right: You want my spot sign. Ragusa has an interesting, if not slightly confusing, city layout. 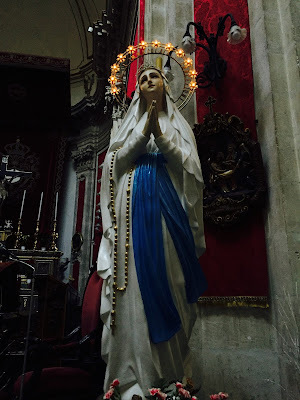 The city is in two distinctive parts: Ragusa Ibla (or just Ibla) and Ragusa Superiore. Going between the two parts by foot is a nice little work out with some serious stair climbs. 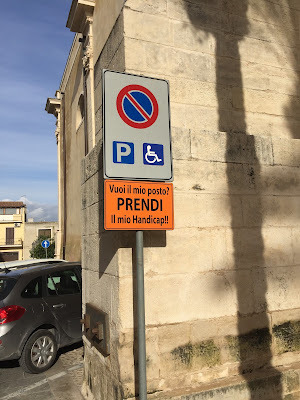 This sign was spotted in Ragusa Superiore. 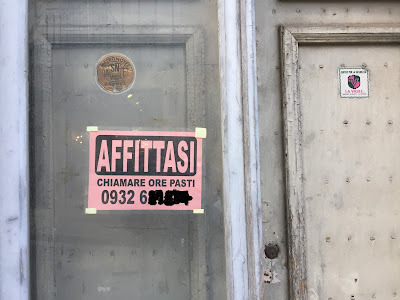 At first, I couldn’t decipher the phrase ore pasti – thinking it was the name of the person renting the space, Signor Ore Pasti. 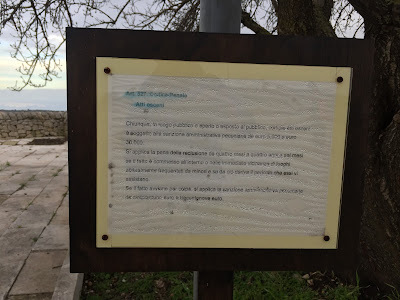 The pronunciation of affittasi along with vendesi and cercasi is and always will be tricky for me due to the placement of the stress affìttasi, véndesi, and cércasi. Seen in Rosolini, Sicily. The sign speaks for itself.